Purchase DVDs through AznFilms to support LoveEkinCheng.com. To learn more about this affiliation, please click here. - Let's Go Slam Dunk! Does Hong Kong really need more than one actor? We must report something wonderful. As of today, representatives of Ekin Cheng have purchased LoveHKFilm.com. Instead of the poor humor and tasteless commentary by former Webmaster Kozo, we at LoveEkinCheng.com promise thrilling coverage of Hong Kong's foremost actor/singer. Our mission statement is obvious: to spread the joys of Ekin Cheng, whether the real Ekin Cheng likes it or not. We hope he will be pleased. Though Ekin Cheng really cared nothing of Kozo's constant disparagement, we at LoveEkinCheng.com had nothing but ire towards the former Webmaster. His jokes were ill-advised and often erroneous. We dare Kozo to be as handsome or as popular as Ekin Cheng; surely those are feats beyond his meager skills. Furthermore, we doubt Kozo could act as well as Ekin Cheng could. Could Kozo have an eighteen year-old wife? And could he be a Man Called Hero? We think not. When Kozo scores with Gigi Leung, maybe we'll be as kind. Until then, he will only be a Man Called Zero. Though former reviewer Sanjuro did not like Ekin Cheng, we will report on his marital bliss. Sanjuro wed a popular Hong Kong celebrity recently, and in exchange for coverage, we are asking that he cease and desist his disparaging remarks of Ekin Cheng. 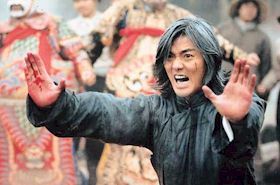 Know this: Ekin Cheng could destroy Sanjuro, just as surely as he could destroy Kozo, Magicvoice or Raindog. We decided to ask The Man on the Street about Ekin Cheng and LoveHKFilm.com. Let the truth be known! Through a spokesperson, Ekin Cheng released the following statement: "While I didn't care for that Kozo guy's site, this new LoveEkinCheng.com site really gets my goat. I don't like fans speaking for me. I wish these fans would go become fans of Aaron Kwok or something." We at LoveEkinCheng.com don't believe Ekin would ever say such a thing. It's probably more likely that it's Kozo being bitter. Does his evil know no bounds? Shut up, Kozo! 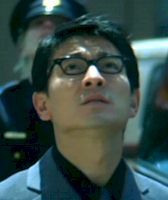 And return Ekin Cheng's hairstyle! Who should Ekin date next? What should happen to Kozo for his poor treatment of Ekin Cheng? - The site is under new management! Ekin Cheng supporters have purchased LoveHKFilm.com! - The Ekin Pick of the week is The Wesley's Mysterious Filofax (2003). - Added Sanjuro's reviews of White and Wong Detective Agency (USA 2003) and The Legend of the Legendary Legend (USA 2003). - Added EkinCheng's review of My Wife is Nineteen: Yoyo Returns (2003). - Added news of Sanjuro's Wedding! - We talked to the Man on the Street! - Added two new polls! - The old Webmaster did some stuff. We forget what it was. Wesley Returns! They said it couldn't be done: a sequel to The Wesley's Mysterious File. Well...they were wrong! By enlisting Hong Kong's greatest director Johnnie To, American screenwriter James Schamus, and the comedy stylings of Wong Jing, they've made The Wesley's Mysterious Filofax, a sure-fire Hong Kong Cinema winner. If only all movies were this good.